With this surf camp, you can learn to surf from scratch or improve your current level. 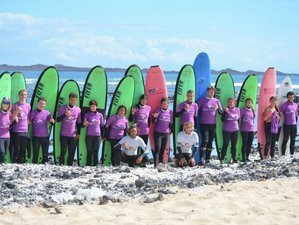 Corralejo Surf School assures you receive the best level of learning according to your level and knowledge. The instructors have extensive experience and are certified by the Surf Federation. Spend your time here, disconnect from your routine, and relax in a natural environment of surf and sun on the beaches of Fuerteventura. If you have an active and positive lifestyle, the Surfing Colors Corralejo Apartments are the perfect accommodation for you to enjoy outdoor active experiences in a unique and comfortable setting. These apartments for surfers in Fuerteventura located near Corralejo beaches combining rest, personalized attention, and special services for groups and families. All of them are modern and fully-equipped apartments. Also, there is a climatized pool at this apartment. When you choose the standard studios you choose the best quality price ratio for your accommodation in Fuerteventura. They offer city views to the Atlantic Ocean, private balcony and free Wi-Fi, which makes them perfect for a surfing holiday with the maximum comfort and intimacy. These 30-square-metre studios feature a bedroom with two single beds, dining room and kitchen, fully-equipped bathroom and tailored services. The 40-square-metre standard apartments are a perfect accommodation option for a holiday with your family or friends. All of them feature a bedroom with two single beds and a sofa bed in the living room, so they can host up to three adults or two adults and two children. They also feature an outdoor balcony, TV, kitchen with electrical appliances, free Wi-Fi, and a perfect refuge by the sea. If you have never tried surfing, this is your chance. You will start from level zero and Corralejo Surf School explains in a very simple way all the steps with the best learning material, with monitors always watch your activity so that in no time for you to run any risk. You are tired of taking foams and want to start catching waves with walls, the monitors will come with you and they will help you catch green waves, your first walls. Long time you catch waves and you see that you need an extra to get to do that maneuver that never ends or you feel that your style should improve or you do not understand how to get more speed, more power, more control. It's your moment. Corralejo Surf School puts at your disposal the possibility of a monitor dedicating all your time. This way, you will get to increase your surfing level. Corralejo Surf School teaches style correction and good style equals a good surfer. This camp will be taking place in Corralejo, Canary Islands, Spain. The Corralejo Surf School offers surf camps in both surf houses and private apartments. Surf courses are available for all levels.